"Tens of thousands of pounds worth of lost bags and belongings are being sold off by airlines at auctions across the country...A baggage crisis at Heathrow has led to suitcases being piled up in corridors at the airport, left outside in the rain or sold at auction houses. 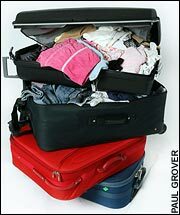 Hundreds of suitcases are put under the hammer every week - with clothing still inside. Scores of iPods, mobile phones and digital cameras are removed and auctioned separately. Airlines insist that the luggage is only sold after going unclaimed for three months, but insiders at auction houses say that in reality some items have only been missing for a few weeks when they are sold. A worker at one of the main auctioneers, R F Greasbys in Tooting, south London, said he expected record numbers of bags to arrive in coming months." I'm beginning to think airports are where the worst and stupidest features of modern British society are laid bare. Now read on. Hi,I hope you dont mind me asking, but I would like to find out where the auctions are for buying lost luggage I was unfortunate that my luggage was lost. and I would like to search for a needle in a haystack by tracking my luggage, very important was my life time collection of photos of all my family. They can never be replaced, I hope you can help, Kindest Regards Bridget, I now live in England.